The IT world is one that is ever evolving, with new concepts being introduced on a regular basis. Being an IT professional is not an easy task. It is important to be up-to-date with the newest methods that are being used, while also being informed of the basic concepts of the past. This not only makes work easier, but also makes you a more sought after, educated IT professional. 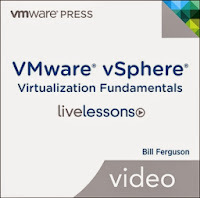 One course that can help with this is vSphere Virtualization Fundamentals LiveLessons, offered by VMware Certification Marketplace. The course is offered by bestselling author and VMware certified trainer, Bill Ferguson, and covers all topics needed for creating virtualized data centers. Virtualization is one of the most important and leading feilds in the IT world today. Most IT professionals have basic knowledge about virtualized data but would like to learn more and gain experience in this field. This LiveLesson course is the best place to start learning more about virtualization. The videos start with the fundamentals of virtualization and move on to talk about topics that relate to the creation, management, and control of a VMware vSphere virtual data center. From the core concepts to the very specifics, this course offers everything any IT professional will need to know about virtualization. It offers lessons with regard to vSphere, virtual machines, and virtual resources. In addition, the course also offers lessons in regard to management and control of virtual data centers. By the end of the course, IT professionals will have a great understanding of the basics of vSphere. With eight lessons and numerous hours of video tutorials, this package course comes in an affordable price of only $149.99. The best part about this package is learning by seeing and hearing a real person – not by reading a heavily technical book. Do not wait any longer. Quick start you career in virtualizations today! "Free from the Shadows" the very best. I like the concept. I simply begin to write my paper after i see clearly. I had been while using Edubirdie Instagram in individuals occasions. It's the great service for authors and journalists. They always write perfect texts which inspire me to operate by myself works. The very best motivation! And fantastic way to avoid wasting time! The fishing resume should be very specific and interesting, I think, but I never wrote this or even seen it, so thanks to the guys who shared their examples. Fishing is my hobby, so I'm not going to look for work in this area, but the area in which I work is also quite specific, so I also needed a special resume when I was looking for a job. Then I stumbled upon https://careerenlightenment.com/creative-ways-to-use-linkedin-in-your-job-search and decided to try their work. They did a great job, so maybe you should contact them too.